It’s play-off time in the NBA, and last night I was at the United Center to see the Chicago Bulls handsomely beat Miami Heat 107-89. which gave them a 2-0 lead in the best of 7 series. These games are a repeat of last season’s match-up, when the Bulls bravely lost and then watched Shaq and Wade's Miami go on to win the championship. 12 months on tho ugh and the Bulls continued their exciting improvement under coach Scott Skiles, particularly in pressurised games and against big players. Games during the regular season are too many in my view and although the most consistent survive and make the play-off's too many games are sterile and boring affairs. 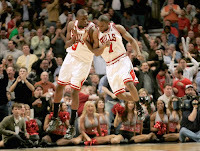 The play-off's are to the contrary and the atmosphere in the United Center last night was electric as Chicago fans roared the young Bulls onto victory, with Lewisham boy Luol Deng and London born Ben Gordon outstanding (left). The next two games will be in Miami, starting Friday and its on the champions home court, where the Bulls will look to finish the job and move into the Eastern Conference semi-finals for the first time since the Michael Jordan era in 1998.